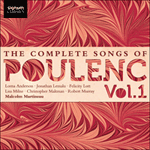 This set of three songs, originally accompanied by small instrumental ensemble, is an evocative time capsule of popular culture during a certain period in post-war French life—the city’s music halls, the Medrano circus, Marseilles (according to Poulenc), the contemporary preoccupations of the media, somersaults of memory. Influenced by Erik Satie and his ballet Parade, Henri Hell explained that ‘the source of inspiration is the same—the circus, the travelling fairs, with their poetry, tender, mechanical and droll’. 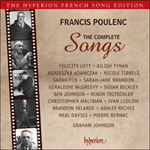 Poulenc says that the essential thing is to believe in the words (printed in Cocteau’s Poésies 1917–1920, where the three poems are grouped together under the title Cocardes), ‘which fly like a bird from one branch to another’. The end of one word is often the beginning of the next—‘Carnot, Joffre’ leading to ‘J’offre’, ‘Un bonjour de Gustave’ juxtaposed to ‘Ave Maria’, ‘piano mécanique’ morphing to ‘Nick Carter’ (a popular American detective serial), and so on; indeed this technique also applies to the titles where Miel de Narbonne is followed by Bonne d’enfant and so on. Use your heart. The clowns flourish on golden manure. To sleep! A kick with the toe; one flies. Moabite, lady of the blue cross. Caravan. Sailor, neck, pompon, moustaches, mandoline. Miel de Narbonne is extremely fragmentary with many changes of tempo, a veritable patchwork quilt of experiences and the allusive phrases of yesterday’s century. The child’s invitation to play (‘Voulez-vous jouer avec moi?’) is charmingly rendered by Cocteau into child’s dialect, and this is the key of the cycle—it is a revisiting of childhood memories by a Parisian ‘enfant gâté’. The musical phrases that connect the seemingly arbitrary images of caravan, vanilla, pepper, tamarind jam are the first genuine expression of human (rather than bestial) nostalgia in Poulenc’s songs—moments of luxurious repose that alternate with mock fanfares and winsome coquetry. Use your heart.The clowns flourish on golden manure. Tecla: our golden age. Pipe, Carnot, Joffre. Giraffe. Wedding. A good day from Gustave. Air by Mayol, Touring-Club, Phonograph. Nick Carter; that’s a nice thing! Bonne d’enfant is a disingenuous Mozartian pastiche (via neoclassical Stravinsky), with many contemporary allusions—it is only when reading Apollinaire side by side with Cocteau that one realizes how superior, and how much more subtle, was Apollinaire’s ability was to synthesize past and present. Giraffe.Wedding. A good day from Gustave. Piece for solo cornet, polka. Soft caramels, acid drops, mint pastilles. ENTR’ACTE. The smell in sabots. Fine game bird of satin killed by the drum. Bird-catcher by his own hands. Enfant de troupe is an enchanting rendition of a circus scene, replete with popular cultural references, Andy Warhol avant la lettre. Ushers with trays of sweets and refreshments shout out their list of comestibles during the interval. The most powerful moment in the song is at the end where a trapeze artist crosses from one side to the other of the high-wire in the midst of enormous suspense. The orchestra raucously strikes up at the successful conclusion of the stunt.